This Sweet Corn Bread is the perfect side dish for your favorite meal! It is super moist and has a nice hint of sweetness to it. I haven’t met a person that doesn’t like it! As a kid, I hated corn bread. I thought corn bread and sourdough bread were an abomination. While I still haven’t fully grown out of my dislike for sourdough, the exact opposite is true for this sweet corn bread. I love it now! Give me a piece of warm, freshly made corn bread, with a slab of butter on top and I am perfectly content. How can I make this sweet corn bread into sweet cornbread muffins? If you are wondering how you can make this recipe into sweet cornbread muffins, feel free to visit this Sweet Cornbread Muffins post! I shook things up and I don’t whip the egg whites. A lot of people have told me that they notice a difference when they whip them versus when they don’t, so test them both out for yourself to find out which way you like best. Either way, this sweet corn bread is so amazing and won’t let you down! Can I freeze this sweet corn bread? Yes, you can! Let it cool completely before freezing and store it in a freezer storage bag. It is good in the freezer for up to two months. Let it thaw on the counter before reheating in the microwave. Place a mug of water in the microwave while heating it to keep it extra moist. This Sweet Corn Bread is the perfect side dish for your favorite meal! It is super moist and has a nice hint of sweetness to it. I haven't met a person that doesn't like it! In a medium-size bowl, combine egg yolks, milk, vanilla, and melted butter and stir. Add the cornmeal, flour, sugar, baking powder, and salt. Stir until fully combined, but do not over mix. Pour batter into a greased 9x13 inch pan and bake for 25-30 minutes or until an inserted toothpick comes out clean. This corn bread makes the perfect to side to just about any meal. Try it with our personal favorite – a hearty bowl of chili! Excellent cornbread. I made it as you had it. Except used only 1 cup sugar. Forgot egg whites Still turned out really good. This cornbread is way too sweet. It does taste a lot like cake which could be the vanilla. I’m glad I tried it and that you have sweet in the recipe title. I just made this recipe. It’s now on my favorite list!! Thank you! Oh, I am so happy to hear it! It’s definitely our favorite corn bread recipe. I’m glad you love it too!! I left out the egg whites as I poured them down the sink before reading through the whole recipe but I thought it turned out ok. It was a bit crumbly, but still tasted good. I left out the egg whites by mistake but it turned out well, although a bit crumbly. Do I use 4 egg whites or egg yolks?? Says whites in the ingredients but yolks in the directions. Thanks so much! Can’t wait to make these tonight! Looks delicious! Can’t wait to try it…I love cornbread! It says it Serves: 15-18 squares. Depends on how big of pieces you cut . I mixed everything and realized I don’t have baking powder. Should I throw the whole thing out or bake it anyway? I was looking forward to this today, lol. I mixed everything and realized I don’t have any baking powder. Should I throw the whole thing out or bake it anyway? I was looking forward to this today, lol. I made this corn bread tonight. I didn’t have the freeze dried cornmeal, so I used corn meal from the store. This is delicious cornbread! I’ve been looking for a moist, sweet cornbread and now I have found it. I also ordered the Thrive freeze dried cornmeal to use next time. BUT…I HAVE A QUESTION!!! Is the baking pan size (8×8) correct? I followed the recipe exactly (except for using store bought cornmeal)….and it made far too much batter to put into an 8×8 pan. I baked it in a 9×13 pan (35 min) and it worked perfect…rose to the top of the pan. I can’t imagine how this would work in an 8×8 pan without going all over the oven. So I’m just wondering if that is a misprint…or if using freeze dried cornmeal makes less batter somehow. I do live at a high altitude (Utah) if that makes a difference. Thanks for the recipe. It’s a keeper! If you read the entire recipe, it says to add the yolks to the batter with everything else. Mix it up and beat the egg whites until stiff peaks form. Then fold the egg whites into the rest of the batter. This is the best corn bread recipe I’ve eaten! Could you make this using only corn meal and no white flour? Can this be made using only corn meal and no white flour? Made these yesterday. I like the light texture due to the egg whites! The sweetness was a bit overwhelming, so I would try using only 1 cup sugar next time, instead of 1.5 cups. In order to cook the bread faster, I put the batter into muffin cups instead of a pan. It made 24 muffins. If I used a pan, I would definitely have needed a 9×13 rather than an 8×8. I’ve made this twice already and it is by far my favorite cornbread recipe yet. It is very sweet but that’s how I like it. I agree with other people that 8 x 8 is too small. I made it in my 9 x 9 Pyrex last time and aside from it almost overflowing, the outside cooked too quickly and the middle was still raw. I had to cook it a little longer So the whole thing came out pretty brown. It was still yummy though. Today I am making it in a 9 x 13 pan. It will make a great side dish for dinner tonight/ breakfast for tomorrow. Thank you for sharing! I just mixed these up to go with some 15 bean soup I made from scratch I too had to use a 9×13 pan, Sarah, I’m wondering if you’re not getting the same volume w the freeze dried eggs as you would with fresh. if you get water into egg whites they wont beat up as much either and once you freeze or dry out eggs they no longer cook the same as fresh. Eggs are a leavening agent so when frozen it breaks it down so you arent getting as much egg white beaten like those of us using fresh. I also used cornmeal mix, I saw someone ask about using it, I used 1 3/4 of the mix and 1 cup of flour, skip the baking powder, add the salt and sugar and then do the wet ingredients as normal. My mix turned out great I’ll update after it comes out. Just want to thank you for a great recipe! I made this to bring to a luncheon I was invited to. The bread was a hit! It is hands down the best cornbread I have ever made. So easy and sooooo good! Thanks again! I just wanted to thanks you for an awesome recipe! I made it for a luncheon I was invited to. The bread was a hit! It is hands down the best cornbread recipe I have ever tried! Thanks again! This is the BEST cornbread EVER!!!!!!! Thank you!!! Made this tonight and it was a winner for all. As soon as it came out of the oven I brushed the it with butter. Kids couldn’t get enough. Finally a corn bread that isn’t a dried out brick. This is my first time making corn bread, and it is delicious! Moist, sweet, just perfect! And I am one of those who hated corn bread because it felt too dry, but this is nothing like that. Hooray! It’s definitely a corn bread game changer for me. I’m so happy you like it! i have to laugh at all the people writing to say they didn’t use the egg whites because they missed that step. Don’t you read through the entire recipe BEFORE you start cooking. That’s what my mom thought me. Besides, there’s only 5 steps! Just a poke in your sides! You don’t have to go to all that trouble! Just buy a box of Jiify Corn Muffin mix. Add 1/4 to 1/2 cup sugar and a little extra milk. Bake in 8×8 pan. My husband from farm life. He says best he has ever had,that’s saying a lot!!! Best corn bread EVER! My family loves when I make it! Made recipe as listed and it turned out perfect. Very nice flavor, light, sweet, everyone in the family liked this corn bread. Will make this again. Thank you for sharing. Perfectly sweet (I cut back on the sugar by 1/4 cup), and very moist. It doesn’t crumble and fall apart. I used a 9×9 pan. This will be my go-to recipe for cornbread. Thank you for sharing this excellent recipe! We just made these. I used only 1/2 cup sugar. Baked mine in muffin tins. Hoping they are yummy. My new favorite recipe! Folding in the egg whites is genius. This rivals Famous Dave’s cornbread muffins which are a favorite of mine! the recipe that I just looked at says to use 9×13 dish but I have seen a lot of complaints about 8×8 have you changed that or what am I missing about size dish to use? This cornbread recipe is delicious! It was a hit at Thanksgiving dinner! I’m thinking of making another one today! I made this tonight and it was a hit! I only used 1 cup of sugar and that was the right amount of sweetness for me. This is the best cornbread I’ve had! This is absolutely delicious! Best cornbread I have ever made. Yum!! 12″ cast iron skillet works great with this recipe. First time I made it, my daughter asked to have it for her birthday cake! I’m trying a little twist by replacing some of the sugar with honey, but every time I make this it is a hit! This looks awesome! I’m always looking for a good side option to go with dinners, and easy take along a for our camping trips. Looking forward to trying this out soon! I was hoping for it to not be so crumbly. Any suggestions? Has anyone tried adding jalapeños to this recipe? And how would you adjust the recipe to do so? I want to bake this tonight but not sure what you mean by cornmeal. I live in South Africa where it is not easily found. Are you referring to sweet corn from a tin or the actual cornmeal like a flour? Please help as my mouth is watering already!! This is my go to cornbread recipe. I half the amount of sugar and it’s still plenty sweet. Thank you for an amazing recipe that everyone raves about! Just made this. SO so good. My husband couldn’t stop himself. It is sweet, but by no means overly sweet. Nice and moist. I could sit down with the entire 9×13 and a fork and be a very happy pregnant lady. I made the recipe as written, except I forgot to separate the eggs. Not sure if that really matters. It was definitely tasty and moist. For me, it was way too sweet. I think I would only use 3/4 cup to 1 cup of sugar max next time. This cornbread is fantastic! I’ve made it three times now and always get rave reviews and never have a single piece leftover. I have never separated the eggs and it’s turned out beautifully- I’m sure it would be fluffier and extra good, but laziness has always prevailed. I also half the recipe and it fits in my 8×8 pan like a dream. Just found this recipe. HUGE hit with my family. Thank you! i had been trying to replicate the Whole Foods cornbread for awhile and this is it, but even better! This is the absolute best corn bread I have ever eaten! My guys loved it! This is now the family recipe. Thanks for sharing! I am so excited to make this cornbread! However, I am confused by what you mean when you said fold the egg whites carefully into the batter. Can you or anyone explain? Can you cut this recipe in half? Does temperature/time alter if so? This is in the oven now. Very easy to make. Anyone else have the liquids look like they crudle? Once I mixed it again it seemed to smooth out a bit and once it was in the mix, it was perfectly smooth. I may keep it seperate next time. Omg! Cooking it right now, smells and looks wonderful! I’m sure it’s great. Thank you for the recipe. You’re welcome! I hope it turned out great! I made it this last week too and it never gets old for me! So good. Made this recipe twice and it’s a winner! I followed the recipe and it came out so good! First time, I used the 1 1/2 cups of sugar and then the 2nd time I used 1 1/4 cups of sugar and it was still good! I used a 9×13 pan. I got texts the next day saying how good it was and I have relatives from out of town now saying it’s so good and want to take some back home! This one is a keeper! Just made this tonight; Fantastic recipe! Even my husband, who really dislikes cornbread, loved it. Although, next time I might only use 1 cup of sugar. I loved that it was moist and cake-like. Usually cornbread can be a little dry and crumbly. Can’t wait to have it for breakfast with some jam and coffee. I tried it before I read the comments which was really good but I will try to cut the sugar down next time but I have to say it’s my favorite cornbread so far and I will definitely be making it again soon! You are so right, this is the best. OMG, I made it and it’s almost gone. Making more tomorrow. This is mine and my family’s favorite cornbread recipe! I was hoping to make them as muffins… how long should I bake them for? Like the looks of your recipe. I have a similar one. Separating the whites is a new variation for me. Will definitely try it out. I also use a cast iron skillet to bake my cornbread. I put the skillet in the oven as it preheats and then pour the batter into the hot skillet. It has eliminated the problem of the center not being done. I am wondering if the recipe would be the same if artificial sweetener is used in lieu of sugar. I live in Florida and cornbread is part of life here. However, I have always had a hard time of finding one that I liked. They are always crumbly, dry and sort of tasteless. Your recipe takes the cake!!!! Sweet and moist…..no crumbs!!!! Best cornbread ever! Love the sweet texture! Perfect with chili! I want to make this but worried about the vanilla in it. Won’t it taste like cake? Already planning on cutting the sugar and using only a 1/2 cup. 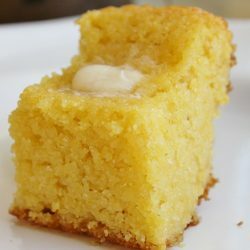 I like sweet cornbread but from the other reviews here and on Pinterest, people are saying it tastes like cake and too sweet. Will omitting the vanilla take away the cake taste to it? Made this corn bread just like the recipe! It was delicious! Taste almost like cake. Will definitely make again. Thanks for posting. It’s in my oven now. I will comment again when it’s done!! I cant wait to try it!! !